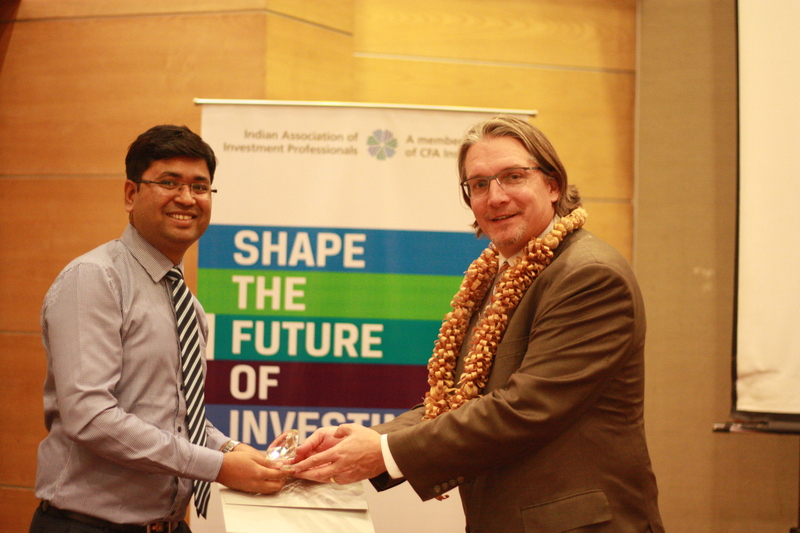 The IAIP Bangalore chapter hosted Steven Birch, President and portfolio manager, William O’ Neill and Michael Gardner, CFA, Head of Global Research, William O’ Neill, on 14th January 2015 at Hotel Royal Orchid, Bangalore. In a riveting presentation, the speakers provided an overview of the history of the firm and its research practises, explained the CANSLIM strategy (the company’s proprietary investing methodology that generated on an average 27.0 percent average annual returns over its history), and elaborated what does an analyst role entail. The firm named after William O’Neil who is a well-known investor and author of best-sellers such as How to Make Money in Stocks, The Successful Investor and How to Make Money in Selling Stocks Short. He is also the creator of a proprietary investment strategy – the CANSLIM methodology. Bill is an astute investor, trader, a student of history and an active researcher. Bill is said to have a razor sharp memory of charts, patterns and price histories. Coming to the research methodology, one important part of the analysis is the ‘Profile Analysis’, i.e., looking for characteristics in leaders (stocks, companies) that could be studied and applied to pick stocks early enough. For example Apple in the year 2006 did have leadership characteristics reminiscent of Xerox in 1964, viz., new products. The profile analysis is a mixture of fundamental and technical reading of the stock. The meat of the analysis is around the acronym CANSLIM – Current Quarterly EPS growth of over 25% (C), Annual EPS growth of over 25% for a 3 year period (A), New Product or New Management or Stock touching 52 week-high (N), Supply – Demand for the stock (S), Leadership – in terms of technical and fundamental -RoE 17% at least (L), Institutional Sponsorship (I) and finally General Market Direction (M). Among the above, the filter for 52-week high does come as a surprise to many. However, what the firm looks for is certain price momentum and support. It negates the corollary, which retail investors hold, that low price is synonymous with cheapness of a stock. Another discipline that the Firm recommends is to always maintain a stop-loss of 8%. Because of this rather stringent policy some of the portfolios of the Firm experience high turnover – between 3 to 4 times. The research process attributes very low weightage to Price-Earnings (PE) multiples as the PE multiples can expand wildly but yet retaining momentum in the stock. The Firm cited the example of AoL which rallied from 200x PE to 500x PE before it began to fall. Also all stock bets are within the framework of general market direction (driven by proprietary algorithm). The firm stays in cash if the general market direction is trending downward so as to protect the portfolio despite there being very attractive individual stock bets. The speakers then elaborated on a topic that kept the audience engrossed – what does the work of an analyst entail? An experienced analyst spends about one-third of his time in identifying companies and the rest of his time on talking to vendors, customers and portfolio managers to market his/her idea and stay up-to-date with the stocks he tracks. The speaker’s advice was for an individual investor is to gather influences from different successful investing strategies and develop one’s own strategy. Once a process is built and followed diligently, the road to financial freedom would be achieved. This entry was posted in Bengaluru, Events, Speaker Events and tagged Aneek Saha CFA, CANSLIM, CFA, IAIP, M Ashok, Michael Gardner, Steven Birch, William O’ Neill. Bookmark the permalink.